Description: H.G. 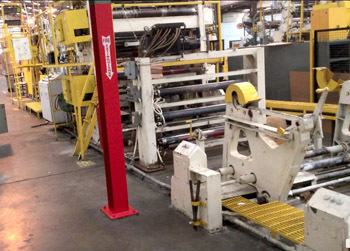 Weber Model 10/50 SOS Bag Machines with 2-Color Printing. The machines make multi-layer square bottom bags. Up to Four (4) Webs. Bag Sizes: Pasted SOS Square Bottom Grocery Bags (small to large), and Large SOS Bags for Yard Debris and Clippings. Each machine has the following: (2) print stations for single color; Three (3) unwinds 50" width x 50" diameter; Web Guides for each unwind; Station for Gluing, Trimming and Combining webs for Multi-Layer Bags; Forming Station with Tooling for many different size bags; Cut to Register Servo Drive; Overhead Bag Press for Dry Time and Accumulating Bags for Discharge to Stacking Table. Drives and Controls included. Spare Parts, Tooling, Forming Blades, and Drawings, Manuals also included. Machines were Running until December 2017. Manufactured by H.G. Weber (Holweg).